Would a Euro switch have allowed me to have just the LEDs on during the day, without the rest of the running lights on? I though I checked the wiring for my B5.5 passat, and the OEM night lights in the fixtures (Where the LEDs get their power in the new fixtures) were on the same circuit as the running lights and no switch could have changed that. But I could be mistaken. Either way I got what I wanted for under $15. Those Euro Switch look pricey. @ChadB: Ah, but that’s the easy way out. Looks like Bill will be buying a lot of HID bulbs and ballasts over the years…. If the HID system is not designed for the Dimming, it will damage the system. Most specifically the low grade dog food that is the china aftermarket HID junk. I think you missed the result of the hack, now the HIDs never see the dimmed power source of the Daytime running lights, the relay keeps them disconnected and off. @bill – Actually, you were punked into responding to our resident troll. @fartface -never- reads the articles he comments on, and only makes negative posts. I think he came to HAD because no one was noticing him on Slashdot. That yellowing problem is easy and cheap to fix. Just wipe them with acetone (nail polish remover) and rinse well to protect the paint around the lights. Yellowing was only one problem, the aiming structures in one of them had broken into pieces, causing it to aim down. The fixtures had to be replaced. Pretty cool. Usually on this site, I expect to see someone have to modify some firmware, download a bunch of crazy drivers, construct an arduino sheild, blah blah blah. Nice to see a hack on this level for a change. factoid: fiancé is the guy, financée is the girl. Let us hope he adjusts the headlights correctly. 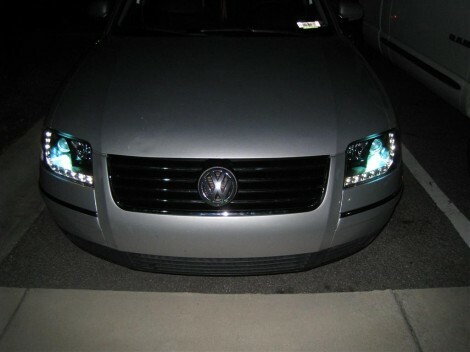 The vast majority of people on the road with aftermarket headlight modifications end up being hazards, as they are poorly aimed, and end up blinding other drivers (not a good thing, it turns out.) Not to mention the common misconceptions about headlight color/ visual clarity. As for the electronics, it looks like he did a good job!